Goings-on in the natural world may seem to be winding down at this time of year, but have you checked our local ponds for ducks? 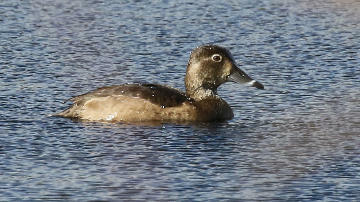 Native ring-necked ducks (Aythya collaris) show up on all our ponds around this time of year. In Westborough, watch for them on Sandra Pond (Westborough Reservoir), Mill Pond (SUASCO), and Lake Chauncy. They’re often in small groups, sometimes with other wild ducks such as buffleheads (Bucephala albeola) and hooded mergansers (Lophodytes cucullatus; see Nature Notes 3/31/06). They can also gather in impressive numbers – in the hundreds – on larger ponds and reservoirs, such as the Sudbury Reservoir near the Southborough-Marlboro line. Fall is migration season for wild ducks, so several different kinds stop on our ponds as they pass through. They’re in their breeding plumage from fall through spring, so males, at least, are somewhat eye-catching. Like most ducks, male and female ring-necked ducks look different in their breeding plumage. From a distance, males look black and grayish white. They have a dark head and back, and white on their sides and underneath. Females are similarly patterned, but with dark brown and tan. You can often spot a triangle-shaped peak near the front of the light area on the sides of both males and females. This duck’s silhouette is distinctive in both males and females, with a peaked head. The peak flattens when the duck dives. Ring-necked ducks are about 16 inches long and weigh about 2 pounds – considerably smaller than our more familiar mallards (Anas platyrynchos; see Nature Notes 2/15/08). 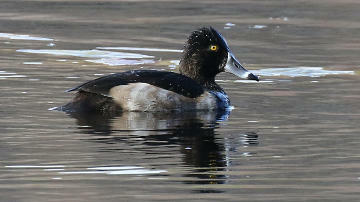 What about the neck ring that gives the ring-necked duck its name? Males have a chestnut-colored ring at the base of their neck, but it’s generally not visible. Instead, look for a different ring – a white ring on the bill of both males and females. These ducks are sometimes called ring-billed ducks because of it. Fortunately for them, all diving ducks don’t eat the same things. Ring-necked ducks mainly eat underwater vegetation, while buffleheads and hooded mergansers dive for animal food, such as fish and mollusks. Ring-necked ducks can find the plants they eat in shallow ponds and swamps, perhaps only 4 feet deep, but they can also dive as deep as 40 feet for it. They also get some animal matter, such as insects, mollusks, and snails. Their diets are general enough for them to find food in lots of different wetlands. Unfortunately, one thing that ring-necked ducks sometimes end up eating by mistake is lead shot. It still remains at the bottom of ponds and wetlands even though it was banned nation-wide for waterfowl hunting more than 20 years ago (in 1991). The ducks scoop it up from the mud along with other items and suffer lead poisoning as a result. Ring-necked ducks are strong swimmers and strong flyers. They winter in the southern and western U.S. and parts of Mexico and the Caribbean. They pair up during their spring migration and nest in wooded marshes and bogs in Canada and parts of the far northern U.S. Overall, ring-necked duck populations seem to be doing well, even though they are extensively hunted nation-wide (during legal waterfowl hunting seasons in fall and winter). The last ducks to pass through our area at this time of year are usually the common mergansers (Mergus merganser; see Nature Notes 12/10/10). These mallard-sized diving ducks move tend to move through just before our local waters freeze. If you enjoy knowing who’s who in our local natural environment, our fall ducks are worth a look.